As I sat down to write this blog I tried very hard to come up with a theme that I could riff on in order to seem sharp and culturally-relevant like my colleague Former Member did in blogs past. Harry Potter? Nope, alluded to that in a SAPPHIRE blog. Star Wars? I’m not as much of a fan as I was, say, eight years ago. Pop music? I heard Drake dropped out of the Hot 100 for the first time in eight years and I got depressed. Doctor Who…Fantastic! I find this a fitting reference, as I have the opportunity to go to TechEd only because Kelly left SAP PRESS a few months back (we miss you!). And as I took over some of her responsibilities—and TechEd ticket—I couldn’t help but feel a little like the Doctor emerging from regeneration. From one position to another…and as I find my footing in this new role, much like the Twelfth Doctor did following 4.5 billion years away from earth, I too will soon be descending upon the Nevada desert to connect with fellow Whovians and SAP techies alike in Vegas! Former Member Getting Started with SAP Cloud Platform and SAP API Management Learn how SAP API Management provides simple, scalable, secure, and unified access to APIs based on open standards such as REST and OData. Carsten Bönnen Road Map for SAP API Management and SAP API Business Hub This road map teaches you SAP API Management and more importantly, to get informed about the most recent developments and the innovations planned for 2017 and beyond. Carsten Bönnen SAP API Management with Cloud Business Application Learn how to use SAP API Management technology with SAP Cloud Platform. Based on a small, hands-on project, find out how to leverage SAP API Management and SAP API Business Hub to create your own business application in the cloud. Richard Bremer Data Aging in SAP S/4HANA with Aging Objects This hands-on session provides the experience to use standard aging objects and develop new ones, create the underlying partitions for the movement of data into the historical part, and thereby “age” the respective records. Richard Bremer Options for Scaling and Managing Data Volume and Workload in SAP S/4HANA Learn about mechanisms offered in SAP S/4HANA to manage data volume and to scale database resources. Find out more about the support for scale-out to scale memory and CPU in SAP HANA, and the active/active read-enabled feature to offload workload. Pravin Datar Extend Your Corporate Planning and Analytics with SAP BusinessObjects Cloud Learn about the ways that SAP BusinessObjects Cloud software can connect to and leverage your on-premise investments in SAP Business Planning and Consolidation and SAP BusinessObjects Enterprise solutions. We call this integration between cloud and on-premise hybrid cloud. Pravin Datar SAP Business Planning and Consolidation and SAP S/4HANA: New Road Map In this session, learn about the new release introduced on the SAP BW/4HANA solution to take advantage of the innovations available in next-generation data warehouse technology. Learn how the revamped user experience provides a modernized look-and-feel to users, and more. Sven Denecken Two-Tier ERP Approach with SAP S/4HANA Cloud Many enterprises adopt a 2-tier strategy that supports a standard ERP in headquarters and a cloud ERP in subsidiaries, effectively creating a 2-tier environment. The ability to use the same product family in a 2-tier deployment, with shared data semantics, APIs, and extensibility platform, supports a high degree of operational integration between headquarters and subsidiaries. Sven Denecken SAP S/4HANA Cloud: Differentiators, Road Map, and Strategy Experience SAP S/4HANA Cloud and understand how both table stakes and the latest innovations define the road map direction in the cloud and differentiate us from the competition. Frank Densborn and Former Member Ensure High Quality Data for Your Data Migration and Go-Live Give customers hands-on experience using a staging database based on SAP Cloud Platform with SAP Agile Data Preparation to perform initial mapping, quality improvement, and loading of data into SAP S/4HANA Cloud. Volker Drees Build Transactional SAP Fiori App: ABAP Programming Model for SAP S/4 HANA Get your hands on the latest ABAP features and build a transactional app with draft and search capabilities. You’ll work with core data services (CDS) and the business object processing framework (BOPF), and expose the data using an OData service. Volker Drees Build a List Report SAP Fiori App: ABAP Programming Model for SAP S/4HANA Get your hands on the latest ABAP features and build a list report app with search capabilities. You’ll work with core data services (CDS) and then expose the data using an OData service. Paul Hardy Real-World Example of Preparing ABAP Code for SAP S/4HANA Hanson Australia has been creating “Z” code for close to 20 years and thus has a very large amount of bespoke functionality. By 2025 it will have to migrate to SAP S/4HANA and converting the Z code will be no small exercise. Walk through the various SAP tools available to analyze systems and draw up an action plan for preparing “Z” code for the transition. Tobias Koebler Deep Dive: Explore and Work with SAP S/4HANA Migration Cockpit SAP developed SAP S/4HANA migration cockpit for the smooth transition to SAP S/4HANA. This new migration tool comes with guided procedures and predefined content. Tobias Koebler Overview: New Implementations of SAP S/4HANA Using the Migration Cockpit As with any major implementation, performing a migration to SAP S/4HANA Cloud or SAP S/4HANA running on premise is a crucial task. To run the migration efficiently and to lower project costs, it is essential to have a tool that helps with a guided process, validation steps, and predefined content. Tobias Koebler Road Map for SAP Landscape Transformation Replication Server SAP Landscape Transformation Replication Server is a proven, real-time data replication technology that is used in different data movement scenarios. This is the official road map session and will describe the future plans of this product. Tobias Koebler SAP Landscape Transformation Replication Server: Real-Time Replication Join this session for details about the new version of SAP Landscape Transformation Replication Server, its functions, and its road map, and gain hands-on experience for a variety of use cases. Markus Kuppe Road Map Q&A: SAP Master Data Governance Discuss SAP’s plans to further support business process efficiency, trusted business analytics, and emerging needs stemming from business networks, the Internet of Things, and cloud deployments. Markus Kuppe SAP Master Data Governance: Central Governance, Consolidation, and Beyond SAP Master Data Governance provides capabilities for many companies on their journey to digital transformation. Look at current capabilities, including process analytics, mass processing, and data quality remediation. Volker Lehnert Data Protection with SAP Information Lifecycle Management Discover how you can benefit from the simplified blocking and deletion capabilities of the SAP Information Lifecycle Management component, supporting corporate compliance efforts. Volker Lehnert Data Protection: Processing and Safeguards in SAP Business Suite Learn about well-known security features such as authorizations or change logging, their importance for data protection and privacy (DPP), and new features dedicated to the support of DPP. Sanjeet Mall Redesign the Mobile Work Experience with SAP Cloud Platform SDK for iOS SAP Cloud Platform SDK for iOS enables you to quickly develop your own native apps with Swift, Apple’s modern programming language. Along with the SAP Fiori for iOS design language, which includes reusable design components, the SDK also allows you to tap into the services and functions available in SAP Cloud Platform so you can build beautiful, intuitive native applications. Tobias Queck and Peter Spielvogel Building Adaptive Screens with SAP Screen Personas Learn to build a more intuitive SAP GUI interface using SAP Screen Personas software. The focus of this session will be to create adaptive designs that render on devices with different screen sizes. Gaetan Saulnier Define, Assess, and Improve Data Using SAP Agile Data Preparation Come and learn how SAP Agile Data Preparation can accelerate business efficiency with trusted data by enabling data stewards to define, assess, and improve data. Gaetan Saulnier Prepare Your Data for Your Analytic Needs with SAP Agile Data Preparation Come and use SAP Agile Data Preparation to see how you can prepare complex data in just a few clicks, so you can focus on analyzing the results instead of focusing on the data preparation. Gaetan Saulnier Road Map for SAP Agile Data Preparation This session will cover recent new innovations, planned innovations and future strategy for SAP Agile Data Preparation. Peter Spielvogel SAP Screen Personas as Part of the SAP Fiori User Experience See a demo of SAP Screen Personas compatibility with SAP S/4HANA, such as the Belize theme, which provides the SAP Fiori UX for classic transactions. And we will show you how to create similar experiences in ERPs. Matthias Steiner A How-to: Microservices on SAP Cloud Platform Two things are key to achieving the needed level of business agility: flexible software and lean management and processes. Enter the microservice. In this session, we discuss how to develop and operate microservices on SAP Cloud Platform. Matthias Steiner Best Practices for SAP Cloud Platform: Proven Architecture Blueprints Receive battle-proven, real-life architecture blueprints you can use for your own cloud applications. Matthias Steiner Production-Ready Programming Model for Microservices Have a look at battle-tested, proven architecture paradigms (and the respective coding blocks) to develop scalable, robust, fault-tolerant microservices on SAP Cloud Platform. Matthias Steiner SAP Cloud Platform: Overview Get a holistic overview of SAP Cloud Platform for people who are new to the topic. Learn the various usage scenarios, including on-premise and cloud extensions as well as new line-of-business solutions powered by SAP HANA and IoT. Ashok Swaminathan Deep Learning Using SAP HANA and TensorFlow This session provides an overview of TensorFlow, developed by Google, explaining what it is and how participants can use it. Ashok Swaminathan Processing Services and Special Data Types in SAP HANA Work through the major processing services of SAP HANA including text; geospatial; linked data, graph, and hierarchies; series; predictive; and JSON documents. Ashok Swaminathan R and Predictive Analysis Library in SAP HANA Look at the the recent innovations in the predictive analysis library (PAL) in SAP HANA and R integration, and focus on our future directions for these technologies. Ashok Swaminathan Road Map – Machine Learning in SAP HANA This session will cover the future directions for machine learning in SAP HANA and highlight some of the recent advancements and future directions. Alisdair Templeton What Lies Beneath: Avoiding the Back-End Development Iceberg Explore various development strategies, the use of layering, and architectures such as “ports and adapters” to successfully build applications in this new world of SAP. Make sure to check them out and ask good questions! And then stop by our TARDIS—er, booth—located in the Community Clubhouse to say hi and debate about our favorite companions! My SCN email address may no longer be valid, BUT I CAN STILL LOG ON! I’m absurdly jealous of your upcoming TechEd trip, Sean, and so glad you’re carrying on the nerd tradition for SAP PRESS blog posts. Especially because…I’ve never seen Doctor Who. Don’t worry, I’m appropriately embarrassed, and I fully intend to fix this one day soon. In the meantime, I know fellow nerds will appreciate the reference, and I challenge them to insert their own Doctor Who allusions into their wonderful presentations. Looking at you, Former Member. This reminds me of a slide in a presentation I did in 2015 at the Australian SAP User Group Conference (the 2017 one happens tomorrow). The subject of the talk was about the enhancements to the ABAP language that came with version 7.40 and how they were so good that you could not recognize the ABAP language anymore. Very neat slide, Paul! 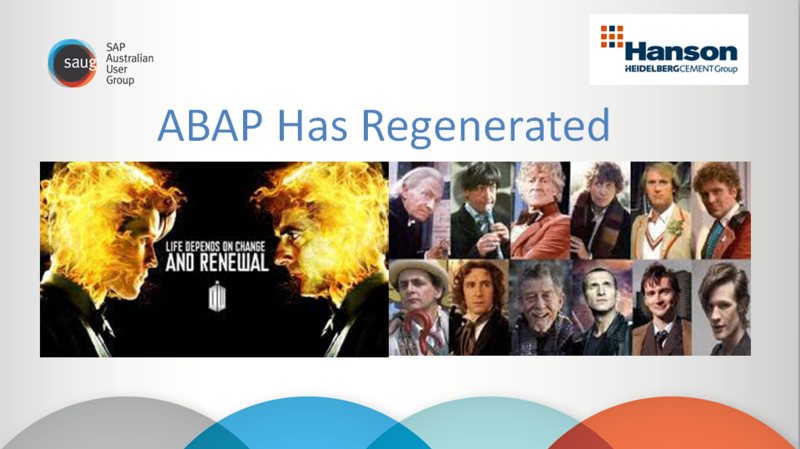 The Doctor and regeneration is definitely a great metaphor to use when describing updates to technology. Same core, different (sometimes drastically) features!